We took a bus ride uphill past the Puerto Rico Capitol and San Cristobal fortress along the Atlantic Coast before the walking tour. While it was sad to see a few buildings damaged by the hurricane, it was exciting to come over the hill for my glimpse of the ocean. The ocean has incredibly Caribbean and Atlantic blue color. Before starting our walking tour, our guide shared plenty of information about the historical buildings, with details about life in the Old City. As we walked the broad lawn to the entrance of Castillo del Morro, he continued to describe what we were seeing - from the Santa Maria Magdalena de Pazzi cemetery by the seaside to the Bacardi Distillery on the other side and the karst from a distance. During the early 16th century, San Juan was the point of departure of Spanish expeditions to the New World. Today, it’s one the busiest ports for cruise ships in the Caribbean. Old San Juan is one of the 3 distinct areas of the metropolitan San Juan. Old San Juan biggest attraction is the Castillo del Morro. I wasn’t really too enthralled about our guide’s very detailed narration about the military history. My interests in military weaponry are slim to none. But the view from the 2nd level of Castillo del Morro was a photographer’s dream – the 16th-century fortress with garitas, the lighthouse, San Juan Bay, and the stretch of ocean with white caps and waves in contrast to the colorful buildings on the bay side. Our guide mentioned in passing that the opening of the popular song “Despacito” official video was filmed there. We walked back passing more historical buildings and walked down Cristo Street and past Caleta de las Monjasto La Rogativa Monument, the Crito Chapel and San Juan Bautista Cathedral, La Fortaleza, the current residence of the governor of Puerto Rico, and quaint streets with colorful buildings. 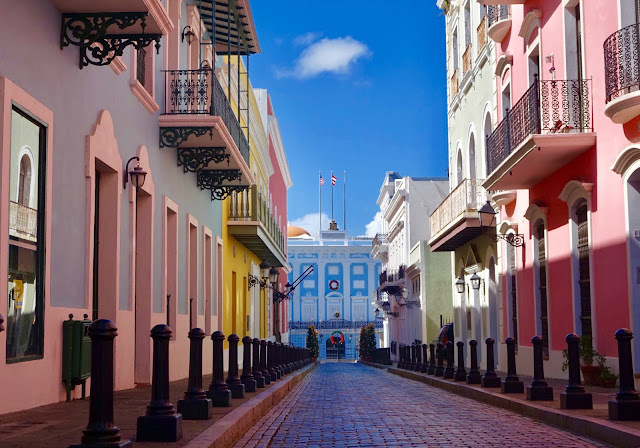 Old San Juan was one great wandering town, truly an old city with a collection of 16th-century architecture with Caribbean charm. After the guided tour, I checked out the arts and crafts market, talked to the vendors/artists and bought lots of souvenirs. I talked to one artist who grew up in New York. She had a very strong opinion about the president’s response to the disaster. I asked her where I could find a good Puerto Rican food nearby. She gestured out for me to go up the street and find the restaurant with big wooden doors. “You can’t miss it,” she said. The restaurant was pretty popular, it was crowded when I arrived. There was a line waiting for tables. I walked up to the bar area and asked the waiter if I could order food there. I ordered mofongo, a dish made of mashed green plantain with shrimp (chicken was another option), it came with fried plantain, beans and salad on the side. With a big camera, a backpack and a big shopping bag, I probably had ‘tourist’ written all over me that a friendly woman sitting next to me asked where I was from. She introduced me to her husband sitting next to her, who explained to me that the plantain in my mofongo probably came from another country because most the plantain plantations in Puerto Rico were destroyed by the hurricane. The talk about food turned into a great marathon lunch conversation about politics and life. I stopped at Walgreens to buy some meds for my mosquito bites. When I saw a pack of bottled water on sale for less than $4.00, I was reminded that I was in a US territory indeed. I returned to the ship to put my shopping bag away. I planned on venturing into New San Juan later that day with some people I met on the ship, but when I saw the dark clouds, I decided to just walk by the pier. I crossed a modern bridge and ended up in a park with a children's playground. Oddly enough, there was a huge open bar in the park. I ordered a pina colada, but the bartender told me that the ‘pinacolada machine’ was not working due to a power surge. I just lingered to use the WiFi. On my way back, I stumbled upon a small coffee shop. There was a smiling old man sitting just outside the door. I walked to the counter, tried to survey the place and did not see a display of pastry. I ordered coffee as if I were ordering coffee from Starbucks. I then realized that the waiter was not behind the counter, but behind me to take my order. Then he asked if I wanted to order something else aside from coffee and showed me a tray of leche flans of different flavors. While making coffee, he told me that they have a WiFi and quick to give me the password. However, I was not able to use the WiFi because he kept trying to talk to me. I learned that the smiling old man at the door was his father, and he owns the shop with his wife, a pastry chef. My day in San Juan ended with a cup of coffee and the most delicious guava leche flan. I did what I set out to do in Puerto Rico: I visited a tourist area that was open for business, spent tourist $$$, ate at local restaurants, and shared conversation with the locals. I realized that the Puerto Rico locals I talked to are pretty resilient, like this uprooted tree that continues to grow and thrive. A symbol of PR resilience - uprooted by the hurricane, this tree continues to grow on the side.